The Fujifilm X mount Samyang 8mm f/2.8 UMC Fisheye II Lens is a prime fisheye lens specifically designed for APS-C sized image sensors. 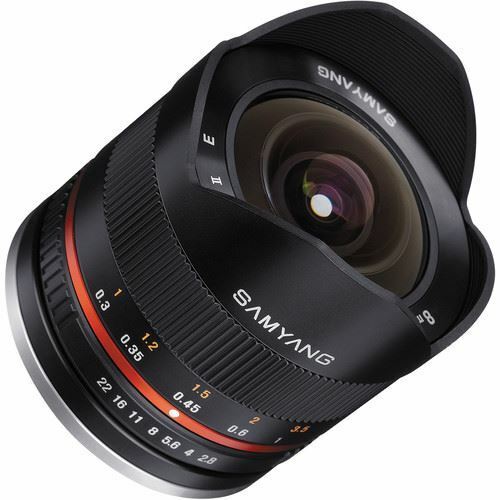 Providing a 35mm-equivalent focal length of 12mm and full 180° angle of view, this lens is well-suited for creative applications as well as interior and architectural subjects. Its fast f/2.8 maximum aperture is further beneficial to working in low-light conditions. Three extra-low dispersion elements and two aspherical elements have been incorporated into the optical design to minimize chromatic aberrations and distortion in order to produce sharper images. 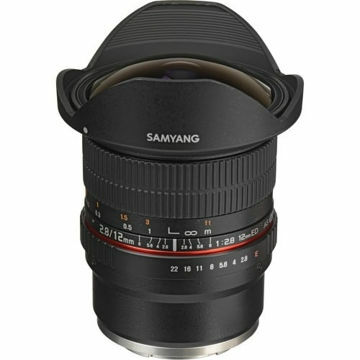 Additionally, the lens' design features a built-in lens hood and a UMC coating has been applied to the lens elements to reduce surface reflections and prevent lens flare and ghosting for improved light transmission and more contrast-rich imagery. 180° fisheye lens provides a 35mm-equivalent focal length of 12mm, making it ideally suited for interior and architectural subjects. Three extra-low dispersion elements and two aspherical elements reduce chromatic aberrations and distortions in order to produce sharper images. Built-in lens hood also helps to reduce lens flare and surface reflections.